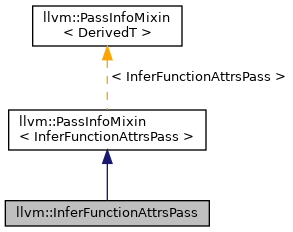 A pass which infers function attributes from the names and signatures of function declarations in a module. Definition at line 25 of file InferFunctionAttrs.h. Definition at line 34 of file InferFunctionAttrs.cpp. References llvm::AnalysisUsage::addRequired(), llvm::PreservedAnalyses::all(), llvm::PassRegistry::getPassRegistry(), llvm::AnalysisManager< IRUnitT, ExtraArgTs >::getResult(), inferAllPrototypeAttributes(), INITIALIZE_PASS_BEGIN(), INITIALIZE_PASS_DEPENDENCY, llvm::initializeInferFunctionAttrsLegacyPassPass(), and llvm::PreservedAnalyses::none().